In 1935, as the artists and animators at the Disney Studio toiled mightily on the animated feature film Snow White and the Seven Dwarfs, Walt and Roy Disney traveled with their wives to New York and boarded the luxury liner Normandie to begin their "grand tour" of Europe. With the full cooperation of Walt's late daughter Diane Disney Miller, Didier Ghez spent years researching this seminal but little-known event that became so vital to the continued growth of the Disney company right through the creation of Disneyland two decades later. His book, Disney's Grand Tour, is the culmination of that research. The early 1930s was a crucial time for Walt Disney: despite the global success of Mickey Mouse, Walt knew he couldn't rely on his iconic alter-ego to sustain his studio indefinitely. He needed new triumphs. So he staked his creative future and his cinematic fortune on Snow White. But the pressure was driving Walt to another nervous breakdown; he needed a vacation. Walt's brother Roy suggested a trip to Europe with their wives. The trip would take the Disneys from England to France, Germany, and Italy, and then back home. While the couples intended to relax and enjoy the comforts of Old World Europe, Walt also had business in mind: his grand tour was not just about taking in the sights but about building the Disney brand in Europe and bringing back to America ideas and source material for new films, new cartoons, and far down the road, a new theme park. 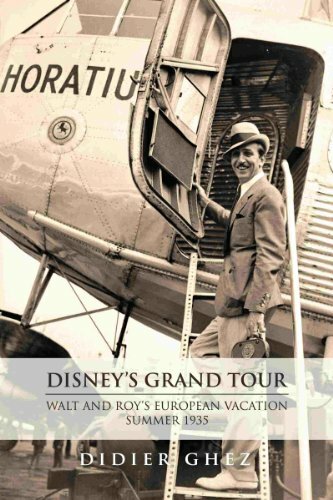 In Disney's Grand Tour, famed historian Didier Ghez traces the footsteps of Walt and Roy Disney as they board the Normandie in New York and sail to England, then travel through France, Germany, and Italy prior to boarding another luxury liner, the Rex, for the trip home. But the book is no mere travelogue: you will be at Walt's shoulder as he conducts Disney business; meets some of the luminaries of his day, including H.G. Wells and Louis Lumiere; attends gala events staged in his honor; and recharges his creative powers for the astonishing Disney projects ahead. And much more besides! In addition to the many "small and delightful surprises" that noted animation historian (and author of The Animated Man: A Life of Walt Disney) Michael Barrier mentions in his preface to the book, Disney's Grand Tour features over 200 notes for those inclined to dig deeper into the story. It also contains a list of the hundreds of books that Walt personally selected in Europe for transfer back to the Disney Studio library. These books inspired Disney artists and animators for decades. So pack your bags. The Normandie whistle blows. Embark with Walt Disney and join him on a grand tour of Europe!